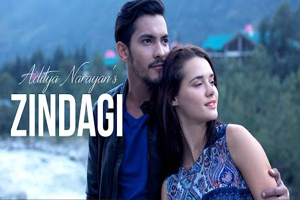 Hindi Lyrics 4 U: Lyrics Of "Zindagi Kya Tera Nasha" From Latest Album - Zindagi (2015). Lyrics Of "Zindagi Kya Tera Nasha" From Latest Album - Zindagi (2015). Beautiful love song in the melodious voice of Aditya Narayan featuring him and Evgeniia Belousova. The video of this song is available on YouTube at the official channel T-Series. This video is of 7 minutes 01 seconds duration. Lyrics of "Zindagi Kya Tera Nasha"
Lyrics in Hindi (Unicode) of "ज़िन्दगी क्या तेरा नशा"